A girl leaves for Oregon and has a hard time saying goodbye to her grandma. Set in the 1800s, the family loads up their wagon with cornmeal , iron kettle, and papa's tools. They know they're going to take a trip that lasts for months. Grandma spends time with the girl and they have fun together. Grandma tells her stories about when she was a little girl. The girls doesn't want to leave behind her Grandma and the stories she tells. She gives her granddaughter a brown book with the stories written down so tshe can read them when she misses her grandma. "Now you'll always be with me, and every day I will think of you and love you." As the wagon left, they sent kisses to each other on the wind. Such a sweet story both about the pain of saying goodbye but also about how we can hold those we love in our hearts no matter the miles between us. For anyone who's ever had to move away (or have those we love do the moving...), this is a powerful resource. Lydia and her family were packing the covered wagon for their long trek to Oregon, a thousand miles away. Lydia didn't want to go, didn't want to leave Grandma. She and Grandma took a walk together, made bark boats together, and Lydia put her head in Grandma's lap and cried. Grandma braided Lydia's hair and told her a story. "I can't go to Oregon," Lydia said, "I'll miss the stories you tell. "Then Grandma reached into her apron pocket and gave Lydia a small brown book. "I wrote my stories down for you. When you miss me, you can read them." Then Lydia hugged Grandma a long time. She breathed her in deep, so she would not forget. "I have to go," Lydia said. "I know," said Grandma. Grandma stood at the gate as the wagon rolled away, and touched her hands to her lips. She flung her arms open wide, and sent kisses on the wind.Lydia sent them right back.It's hard to read this book aloud to a child who is dear to you without becoming choked up. You think what it would have been like to say goodbye to your loved ones, perhaps never to see them again. You give thanks for speedy highways and airplanes, for cell phones and email. And then you think again of those families saying goodbye long ago, and you realize that the book is not just about long ago, but about that wrenching, heart-torn ache of separation at any time, for any reason.A wonderful book, with tender, insightful text and gorgeous watercolor illustrations on every page. A book to be kept and handed down and beloved forever. Leaving a loved one behind is never easy. Lydia is about to move west with her family. While her parents pack up the wagon, Lydia is able to spend a few last moments with her grandma. She will miss having her grandma braid her hair and tell her stories. Anticipating this, Lydia’s grandma gives her a book including all of her anecdotes for Lydia to read when she misses her. The lovely watercolor landscapes portray the profound relationship between a grandparent and grandchild. The compositions and text are placed just right, making the book a pleasant read overall. The story itself is simple enough to follow, but it may be difficult for some people to relate as the relational bond between a grandmother and granddaughter may not transcend to everyone who reads it. However, the story is well written and beautifully depicted. It is a nice tribute to grandmothers everywhere. My husband and I were recently discussing the loneliness of being away from family members for long periods of time, and how e-mail, long distance cell phone calls, and Skype don't take the place of being able to wrap your arms around your loved one, kiss her cheek, feel her warmth, smell the familiarity of her. It reminded me of this book so I took it home for Hal to read, and I reread it. It's set in the 19th century and told from the perspective of a little girl who's struggling with saying goodbye to her grandmother as her parents are preparing their wagon and oxen for the long journey to Oregon. When I think that people who parted under such circumstances knew they'd never see their loved ones again, it brings things into perspective. Young Lydia's family is moving to Oregon via the Oregon Trail. She has said goodbye to the barn cats and the farmhouse, but she just can't say goodbye to her grandmother. She and Grandma take a last walk together and talk about how to remember each other. 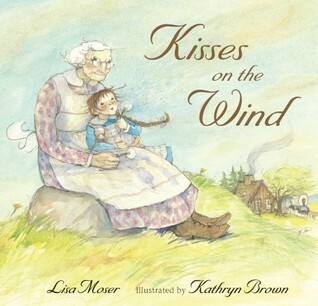 Finally it's time to go and Lydia looks back at her grandmother who is blowing kisses to her and sending them on the wind.A good story for helping children say goodbye. The story can be a tear-jerker for adults because we realize that back then when people left on the Oregon Trail, they would most likely never return to where they came from. So people they said farewell to, it was forever. Almost everyone has to move at some point in their lives, but it's so much harder when you are a little girl moving out west and leaving your grandma behind. This tender story is about the loving friendship that exists between a little girl and her grandma, and the way they say goodbye before the girl moves out west with her family. Grandma knows how to handle the sorrow, and assures the girl that she will be thought of and missed in so many ways. Sweet book. Once in a while the writing seemed off to me, but otherwise not bad. The illustrations were nice, but they too seemed off. The grandmother's proportions kept changing. (She's excessively tall in one picture.) And really--did she have to look THAT old. She looks at death's door. And whichever parent is her child, they don't look that old. Unless they are the youngest of a long line of children who have all gone away, it was hard for me to see a grandmother that old. Though in a pioneer setting, the emotions of leaving family behind are portrayed in a way that is accessible to kids. There are some nice ideas for coping with "the missing," like "picturing," or "when you miss me, teach a new friend to make a bark boat(something they did together). "Too much text for Story Time. Filled with sweet, tugging emotion and precious artwork. Very sweet. I can see my mother-in-law as this grandmother telling her granddaughter goodbye for perhaps forever. Lovely book. Will definitely try to find more by this author. Very thoughtful book about saying goodbye to grandmother before moving. Could be taken metaphorically for a death. Made me cry and would be perfect conversation starter for moving. Sweet book about saying goodbye to someone you love. The grandmother reminded me of my own. Sweet story! Lisa Moser Kathryn Brown - Lisa Moser grew up in the small town of Fairfield, Iowa. "I had a wonderful childhood," says Lisa. "I lived in a neighborhood where lemonade stands were a day's event, the boundaries for hide-and-go-seek were the entire block, and you knew it was time to come home when the streetlights came on." About this time, Lisa was inspired by her grandma to become a writer. "My grandma and grandpa lived in Florida, and we would write letters every week. But on some golden days, some treasure days, I would go to the mailbox and find a story from my grandma. She'd write the stories, draw the pictures, and bind them up with bright yarn. Reading those stories, my own dream of becoming a children's author began. "Lisa went on to attend The University of Iowa and graduated with a degree in elementary education. After getting married, she moved to Worthington, Ohio where she happily taught reading, writing, and other subjects to fifth graders. Lisa is proud to say that she was never beaten in a footrace by any of her students, although she only raced them once. Wisely, she retired a champion.When Lisa and her husband moved to Wisconsin and had their daughter, Lydia, Lisa became a stay-at-home mom and pursued her childhood dream of writing.